Now that Team Canada’s selection camp is done, there’s a full 22-man roster getting ready to face the world’s top junior teams. Beginning on Tuesday, December 26, 2017, are the preliminary games for the 2018 IIHF World Junior Championships in Buffalo, NY and from now until then, the Canadians have a lot of preparation to do. Over the last week, Hockey Canada held their National Junior Team Sport Chek Selection Camp in St. Catherine’s, Ont., which hosted a couple of practices and three exhibition games – the last one against Denmark. Playing against guys from different countries around the world isn’t what most of the Canadian national junior team is used to. Yes, there’s the odd Russian, Czech or Swede among the myriad of CHL team rosters but CHL teams aren’t used to playing against teams comprised totally of international players. Fortunately for the Canadians, they finished the selection camp with a 5-2 victory over the Danish squad, which is a great win two weeks before the real deal. Team Canada’s final roster was announced a couple of days ago and Kale Clague is one of the defensemen who made the team. 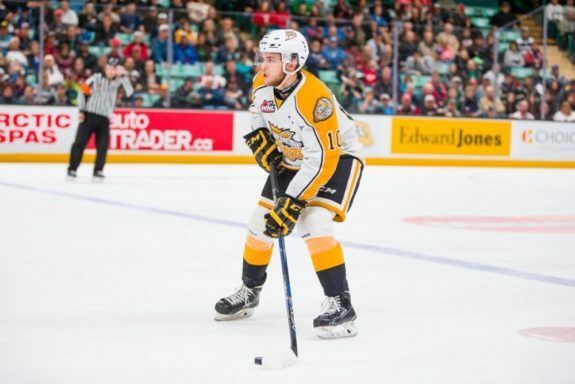 He plays for the WHL’s Brandon Wheat Kings and serves as one of their alternate captains. In terms of point production, he’s the most offensive defenseman on Team Canada’s final roster, based on points during the 2017-18 regular season so far. He was also a second-round pick of the 2016 Draft, selected by the Los Angeles Kings and this will be his second year representing Team Canada in the World Junior Championships. Earlier this year in August, Clague also participated in the World Junior Summer Showcase in Plymouth, MI, which is the first step in Hockey Canada’s player evaluation process. There, the Canadians played against Team USA, Team Sweden, and Team Finland. “Obviously all three of those teams are awesome,” Clague told The Hockey Writers in a post-practice interview this past week during the selection camp in St. Catherine’s. Sweden, they move the puck so good and they’re so fast and they always know where each other are on the ice and I think the same goes for Finland. I don’t know if it’s a European style but I think they always connect well. European teams have created a reputation for themselves over the decades. They play that ‘European style’ with a lot of flare and it’s a look that many have come to recognize, as well as expect. However, in recent years, Team USA has made a whole lot of changes, not just to their roster but in their development leagues and that’s something the Canadians will need to adjust to and prepare for going forward. “[The Americans] are always good, they have so many good players,” Clague continued to say. They’re fast – they always are, and they’re skilled. I mean, those are the two main takeaways for me. I thought their team looked a lot different than it did last December, but, you know, they have a lot of good younger players and they’re obviously going to be a great team again this year. 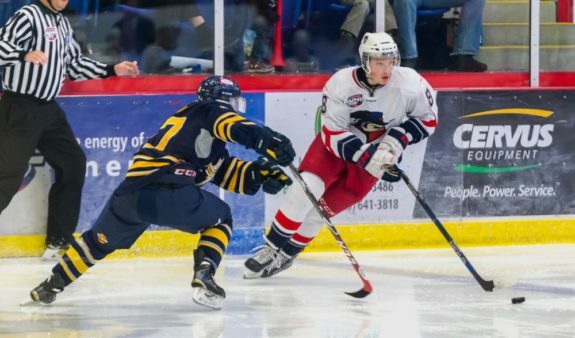 There’s a lot of buzz about the American’s superior offensive abilities and Clague isn’t the only one who can attest to their talented top end. After speaking with defenseman Jake Bean, he too acknowledges their strongest skill sets. Bean was a first-round pick in the 2016 Draft selected by the Carolina Hurricanes and serves as an alternate captain for the WHL’s Calgary Hitmen. This will be his second year representing Canada in the World Juniors and although he’s not the most offensive defenseman on the roster, he understands that the Americans are very offensive and defending well will be a tipping point in Canada’s success. Defenseman Cale Makar, on the other hand, has built his reputation on being incredibly offensive. He was the no. 4 pick from the 2017 Draft, selected by the Colorado Avalanche and made Team Canada’s final roster. This will be his first year representing Canada and he’s also one of two players who play in the NCAA. Just like Clague and Bean, Makar has spoken of the American’s memorable style of play. “Yeah, they’re just a very skilled team,” he said. I could say that about everybody too but you just have to be in the right spots at the right time and if you lose your balance there, they’re hopping right by you or throwing that puck through your stick. Like, they just find every little opportunity to make those plays. It’s going to be a transition but I’m excited to hopefully get a few exhibition games in. 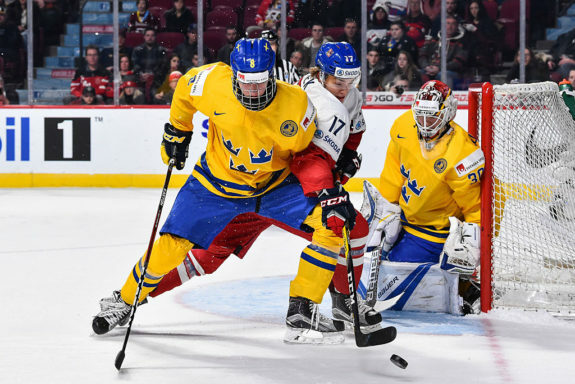 Winning gold this year at the World Junior Championships will be no easy job for either the Canadians or the Americans but at least Team Canada knows that it’s not going to be a walk in the park. This past week in St. Catherine’s was spent preparing for multiple opponents with very different styles of hockey, including tactics that combat the American’s aggressive form. They’re young, fast and skilled on the top end and their backend is no joke either. If the Canadians are going to have any chance of beating them, they’re going to have to be very systematic in their approach to both scoring and defending because that’s exactly what will be thrown at them by all those NCAA-players on the opposite side of the rink.